New Horizons: What Pluto tells us about scientific literacy. Is Pluto a Planet? Who Cares! Science isn’t about facts. It’s about process. 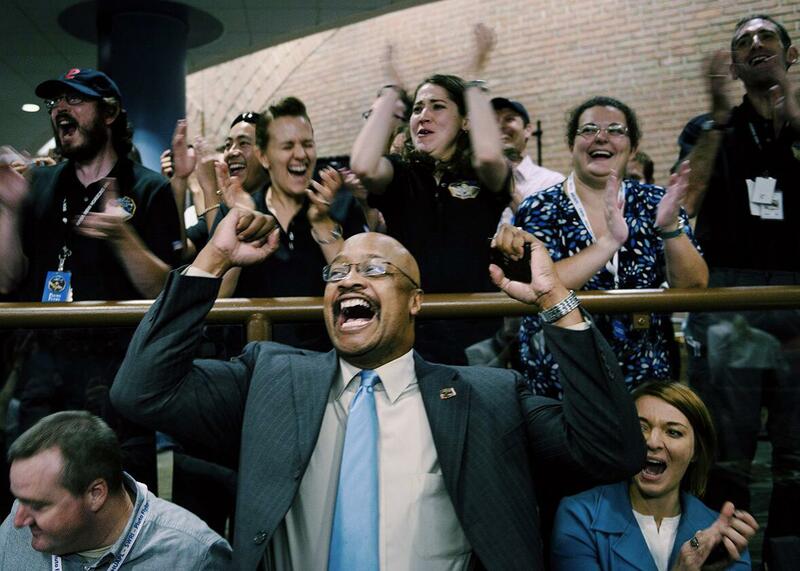 Going mad over method: NASA and project staff react with others as telemetry is received from the New Horizons probe at the Johns Hopkins University Applied Physics Laboratory in Laurel, Maryland, on July 14, 2015. It seems like a significant scientific question, especially as the New Horizons spacecraft’s encounter with Pluto this week reminded everyone of the distant, icy world’s demotion in 2006. This is just one example of a deep disconnect between the public’s perception of “science” and scientists’. Those of us who teach and reach out to the public know that the most common misperception about science is that it is a body of knowledge—words to learn, equations to memorize, and concepts to understand. In this worldview, to be “scientifically literate”—conversant with science at the basic level expected of an educated person—is to have broad familiarity with the vast encyclopedia of existing science knowledge, like whether Pluto fits a particular definition of a planet. But scientists—who are surely scientifically literate—are usually expert in only a small portion of the encyclopedia of existing knowledge. Outside their specialties, scientists can be surprisingly uninformed. Stephen Hawking might have less working knowledge of cell biology than a middle schooler learning the material for the first time. Richard Dawkins may have forgotten the equations describing Newton’s Laws of Motion that he learned in grade school. What makes a scientist a scientist isn’t broad familiarity with existing science knowledge. Nor is it mastery of the knowledge in a particular area (although that certainly helps). Rather, it’s mastery of the peculiar and powerful practices that help us to use existing knowledge and to produce new knowledge. Scientists know how to question their assumptions, discover exciting information using observations and experiments, distinguish reliable from unreliable data, formulate creative but logical explanations of their discoveries, and test these hypotheses by comparing predictions with results from further observations and experiments. Lather, rinse, repeat, and, remarkably, we turn the unknown into the known. That’s what the scientists guiding the New Horizons mission are doing as they turn Pluto from a mysterious, distant blotch of light into a fascinating new world. Their findings will test existing hypotheses about the formation of the solar system and the habitability of icy worlds. They will spawn new hypotheses. They will spur future observations. These scientists aren’t masters of the encyclopedia. They are expert explorers of the unknown. In detail, exploring the unknown can get pretty complicated. A mission like New Horizons really is rocket science. But the overall process isn’t complicated at all—it’s just the relentless application of common sense. That’s a good thing because today, unlike in the past, scientists aren’t the only ones who need this expertise. Thanks to the Internet, most human knowledge is already at our fingertips—so success and survival aren’t about who knows the most, but who is better able to apply and extend what we know. We need more expert explorers, in all walks of life. Imagine two people: John and Juanita. John knows a lot of words, equations, and facts—he is a master of existing knowledge—but he can’t evaluate the reliability of new information, and he can’t adapt to changing circumstances by engaging and testing new ideas. He’s part of the reason that, according to a recent study, only 26 percent of employers say recent college graduates are well-prepared to analyze and solve complex problems, and that only 29 percent of employers feel college graduates are good at locating, organizing, and evaluating information. Juanita doesn’t know as much as John, but she’s great at ferreting out good information. When she gets it, she knows how to use it. She views the unknown as a challenge to embrace. She’s an expert problem-solver. Who is more likely to be replaced by a computer? Who will be the more informed voter? The smarter soldier? The wiser leader? We need more Juanitas—and whether or not she will ever be a scientist, the place to start is the science classroom, because that’s where these skills should be most intensively taught. Unfortunately, we struggle to create Juanitas because, too often, standardized tests and large lecture halls lead us to teach by cramming definitions into students’ heads. When students are taught that science is like an encyclopedia, they don’t learn how to explore what they do not know. Confronted by false knowledge, such as that vaccines cause autism, they aren’t equipped to evaluate the claim and are easily led astray. But teach them that correlation is not causation and arm them with some basic statistical tools, and they can separate fact from falsehood. When students do learn about the process of science, it’s too often as just another topic in a science class—“the scientific method”—that confuses by requiring them to memorize yet more words, equations, and concepts. They learn about the process of science so that they can explain it on a test. But what they need is to learn science through that process so that it becomes a skill they use in life. Little wonder that only 28 percent of college students at four-year institutions choose to major in science, technology, engineering, and math fields. It won’t be easy to fix this problem. A wealth of research shows that active learning, whereby science is taught through the process of problem-solving, is far more effective than traditional teaching, and a movement in this direction is gaining ground one classroom and lecture hall at a time. But advances in educational technology are about to revolutionize our ability to teach science in a more meaningful way, at massive scale. Online education is frequently derided as a pale imitation of the lecture experience. Too often, it is. But that’s a function of the sophistication of the technology and the creativity with which it is used. Both are increasing rapidly. Right now, we’re in the silent-movie stage of online education. Avatar and Gravity are in our future. For instance, the Center for Education Through eXploration at Arizona State University, which we co-direct, develops immersive virtual field trips and other interactive digital experiences, delivered online, that let students learn in rich, active, exploration-driven ways that are impossible in traditional teaching. (Disclosure: ASU is a partner with Slate and New America in Future Tense.) Such efforts build on over a decade of work to develop and study interactive simulations in the classroom by pioneers such as the PhET Interactive Simulations project at the University of Colorado and the Astronomy Simulations and Animations effort at the University of Nebraska. The next frontier is to support these sorts of experiences with automated adaptive tutoring to produce personalized learning experiences, tailored to the individual needs of each student. One of us—Ben-Naim—founded an ed-tech startup, Smart Sparrow, that along with companies like Cerego and Cogbooks, is developing these technologies in ways that empower teachers to teach better, at the classroom scale or beyond. These developments are now making their way into innovative online courses, like ASU’s Habitable Worlds, that one of us—Anbar—created to teach science to nonscientists, motivated by the grand challenge of searching for life in the universe. Unlike the first generation of massively open online courses that focus on facts, Habitable Worlds teaches through rich, active, adaptive experiences that engage and support students through the scientific process. When New Horizons launched back in January 2006, it was widely agreed that our solar system contained nine planets. Nine months later astronomers comparing Pluto to similar bodies discovered in the preceding few years decided that these objects and Pluto are all “dwarf planets,” reducing the number of proper planets to eight. Nine years later New Horizons’ discoveries are reigniting the debate. And nine years from now? Or 90? Perhaps we’ll find the hypothesized “Planet X” or even a “Planet Y,” and the textbooks will be revised again. Knowledge evolves with new discoveries. As it does, so do the words, equations, and concepts we use to describe and explain what we know. But the process that we use to make those discoveries—science—is as valid as it ever was, and more relevant than ever as the pace of discovery increases every year.